Today as people all over the United States celebrate the cohesive power of the American workforce, others have just finished up watching a massive celebration of radical self-reliance and self-expression. The Burning Man Festival, which started a week ago on August 25, 2014, attracted nearly 1.6 million viewers to its live streaming channel. Taking place in the Black Rock Desert in northern Nevada, the Burning Man Festival started in 1986 and occurs every year from the last Monday of August to the first Monday of September. This year over 70,000 attendees (aka “Burners”) celebrated art, culture, and all the self-expression and self-reliance they wanted at the event. The live stream captured all their major ongoings in and around the playa and featured a number of audio interviews with both new and longtime attendees, who often times waxed philosophical on the Burning Man experience. 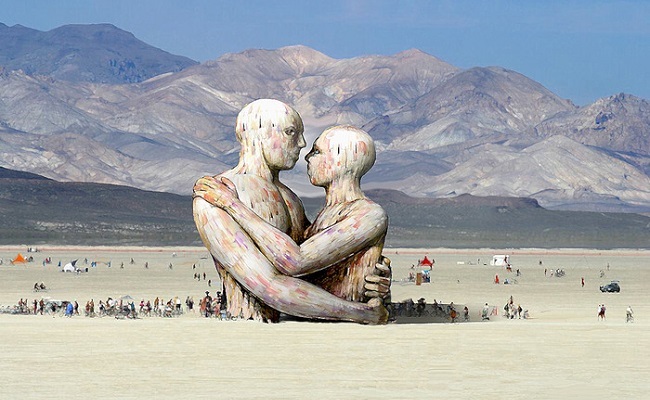 And of course, Burning Man wouldn’t live up to its namesake without a few good burns. For starters, a statue called “Embrace” was burned to the ground on Friday night, August 29. According to Business Insider, the 72-foot statue of a man and woman was made from 160,000 pounds of wood and was on the same scale as the Statue of Liberty. In accordance with Burning Man’s “Leave No Trace” policy, all of the burn remains (as well as the whole of the festival) had to be cleaned up at the end of the event, so the land was left the same as it was before. While the ethic is admirable, hopefully all you have to worry about cleaning up today is the remains of your barbecue.